Social Explorer; U.S. Census Bureau; American Community Survey 2006 Summary File: Technical Documentation. "How to Use the ACS Summary File" is intended to be used as a guide for data users to the American Community Survey (ACS) summary file and the documentation. New users should review this chapter before using the ACS Summary File. The ACS-SF will need to be unzipped before they can be read. The FTP site has 53 directories for the data, which include the United States, the 50 states, District of Columbia, Puerto Rico, and example SAS programs. 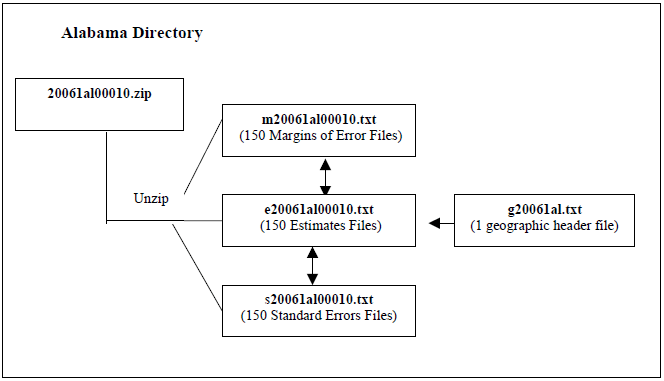 In each directory, there is a geography file for the selected area, and the .zip files are then organized by the geographic areas. For the users convenience, if users want the .zip files for all the geographies under a particular directory, the file all_<state|dc|pr|us\>.zip contains all the files in the directory. This allows the users to save time and not have to download each individual file. 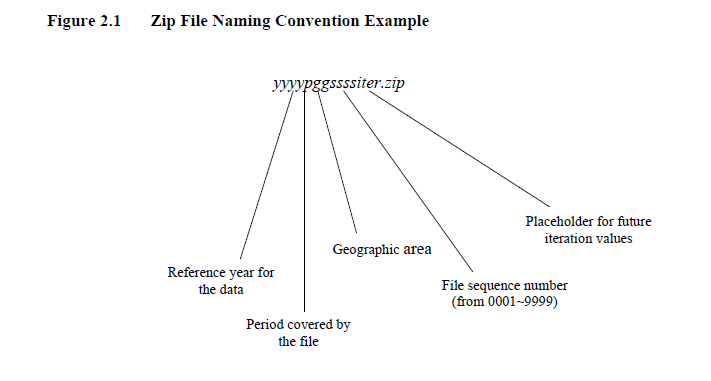 The .zip file names for all of the files follow a predefined structure. 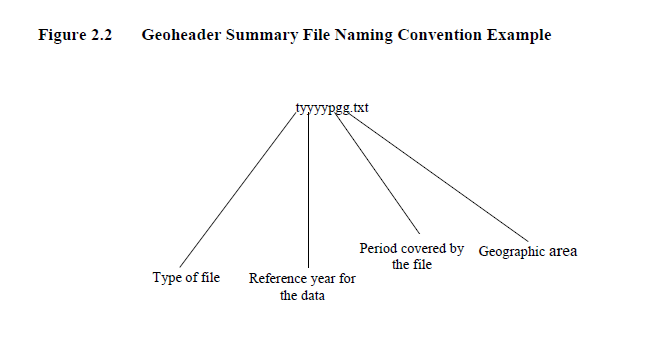 The naming convention will enable a user and/or a computer program to determine the contents of a file from its name. Figures 2.1 and 2.2 displays an overview of the file naming conventions. This sequence number will be used in a manner similar to the approach taken for the SF3. Each sequence number will correspond to a series of detailed tables. Each record of this file will be for a unique geographic area published by the ACS. All the data cells contained in the detailed tables for that geographic area would be on this record. There will be a file for the estimates and a separate one for the standard errors. 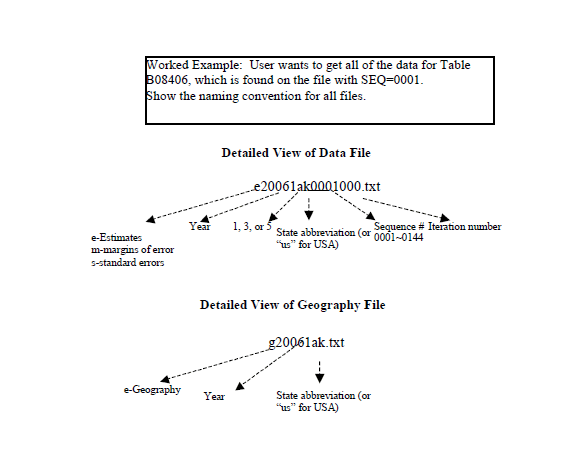 The geographic header record layout is below (Table 2.1). The information in each summary level column is a guide to the presence or absence of additional geographic information on that specific summary level. In each row of a particular geographic area code, there is a listing of the summary levels that contain the area code. For example, to uniquely identify a county (summary level 050) you need to know the state and county code. There are 9 Brown counties in the U.S. and in order to identify it uniquely you need to know the state. Note: The Geographic Summary Levels that are designated, as Reserved for future use will be used for the ACS period estimate data products. These reference names will not be defined in the ACS Geographic Terms and Concepts section until they are used. Detailed information on ACS summary levels can be found in Chapter 4. Chapter 4 identifies each geographic level and provides the code for the level. 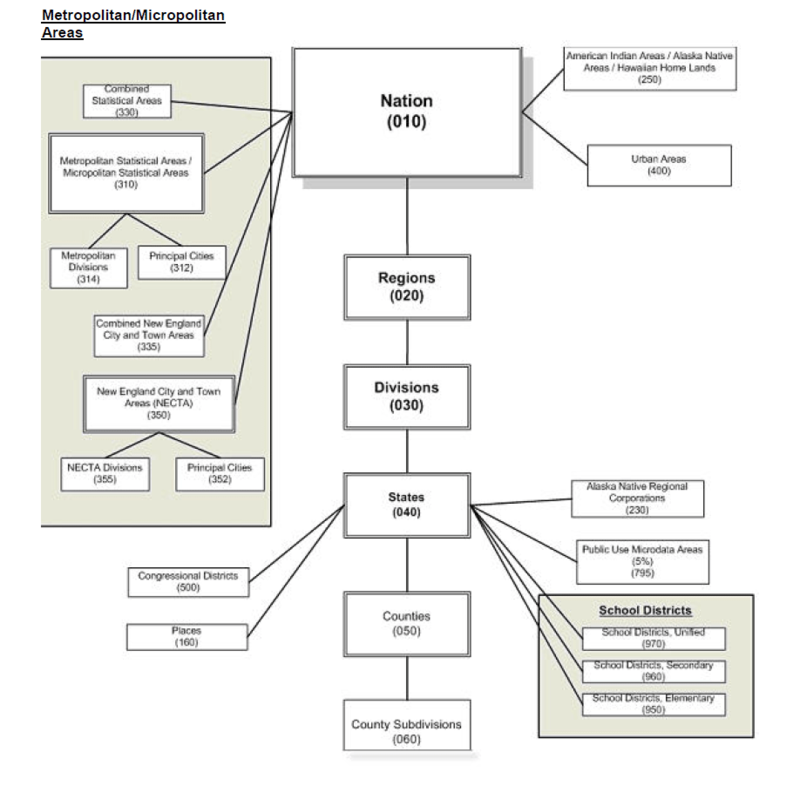 Figure 2.3 provides an example of the various geographic hierarchies used in the American Community Survey. Take some time to review this chart to become familiar with the different hierarchies. Which files do you need? How do you read the files? Start with the data dictionary, merge_5_6_final.xls. Under the "Tblid" column, look for the value "B08406." You will see that the "Sequence Number" is "0001." This means that the data you looking for are in the file "e2006ak0001000.txt." How do we know this is the right file? We know this from the name of the file: the "e" stands for estimate, 2006 is the year, "ak" is the state (Alaska), and "0001" is the sequence number (which contains the data for Table B08406). See the "File Naming Conventions" section in Chapter 2. Now that we have the data dictionary and data file, it remains for us to obtain the geography file. This is much simpler: the file is g20061ak.txt, where "g" means "geography," 2006 is the year, 1 is the period estimate (in this case, 1-year estimate), and ak is the state. The first six fields - from "ACSSF" to "0000001" - are identifiers. The last is a logical record code (LOGRECNO). The LOGRECNO identifies the location within a state. The other fields in the data file, from the seventh on, are data values. Each field corresponds to the value of the "line number" variable in the data dictionary. So field number seven (the 322,541 value, after the sixth comma) corresponds to line number one, which is "Total." Field number eight (the 256,332 value, after the seventh comma) refers to line number two, which is "Car, Truck, or Van." This continues all the way up to line number 51, at which point Table B08406 ends. Each ACS-SF consists of 451 physical files: one geographic header file and 450 data files, of which 150 contain estimates, 150 contain standard errors, and 150 contain margins of error. The larger size of the tables made it necessary to divide the files into smaller segments. Figure 2.5 displays the overview of the contents in an ACS Summary File. Additional information on file/table segmentation can be found in Chapter 5: List of Tables.